Slow cooked chili topped with cheddar cheese and sour cream served with chips. Seasonal lettuce, tomatoes, onions, carrots, dried cranberries, oven roasted beets and candied walnuts with choice of dressing. Thinly sliced rib-eye steak over a bed of crisp, seasonal lettuce, fresh sliced apples, cheese crostini, candied walnuts, and dried cranberries drizzled with a blue cheese dressing. Homemade, fresh pulled mozzarella cheese, vine ripened tomatoes, fresh basil, lettuce, tossed in our balsamic vinaigrette. Add grilled or breaded chicken, or shrimp to any salad for $3.00. Indulge your hunger with the Italian Stallion Salad to start and any pasta. Thursday Night / Burger & Beer $11.00...and Karaoke Night too! Quench your thirst and settle your hunger with a domestic draft from the trough and a juicy Hambletonian Burger! Savor the flavor of our slow roasted, tender, 21 oz. cut of Black Angus prime rib, crushed potatoes, seasonal vegetables, 2 onion rings topped with a wild mushroom au jus. Choice of Shrimp Scampi, Mustard Crusted Tilapia or Glazed Salmon Filet, served with Rice Pilaf and seasonal vegetable. Each burger is made from 11oz. of fresh, 100% USDA Ground chuck then pan-seared to desired temperature. Topped with your choice of Swiss, cheddar or American cheese served on a toasted English muffin with lettuce, tomato, onion, pickle and fries. Warm, sliced corn beef topped with Swiss cheese and sauerkraut served open-face on sliced rye with a crisp pickle. A generous portion of shaved rib-eye steak smothered with sauteed mushrooms, peppers and onions, topped with melted Swiss cheese. 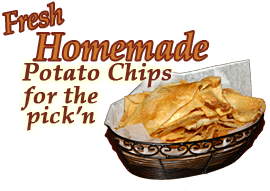 Served with hot gravy to dip and a crisp pickle. Our award-winning vegetarian option! The original, meatless, Morning Star veggie burger, with grilled onions, shredded lettuce, fresh tomato, and honey mustard dressing served on an English muffin with a crisp pickle and fries. Beer-battered cod fillets, fried until golden-brown. Served with seasonal fries, coleslaw and tartar sauce. Penne alla Vodka topped with tender grilled chicken in our delicious, creamy, marinara sauce with fresh basil, roasted garlic and Parmigiano-Reggiano with a hint of Kettle One Vodka. Spaghetti and meatballs, smothered in Grandma D's home-made marinara sauce. Spaghetti Melanza, tender, crispy cubes of eggplant piled high on top of spaghetti tossed with sauce. Penne pasta with Alfredo sauce topped with grilled chicken. Please let us know if we can cater your next family or business affair on or off premises. A menu can be customized to fit your taste and budget.